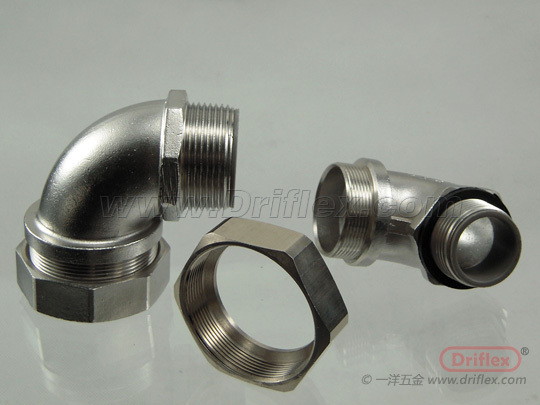 Stainless Steel 90d Angle - Tianjin Driflex Co., Ltd.
Connector body with hexagonal wrench surface, thread ISO metric in accordance with EN60423 or thread NPT in accordance with ANS/ASME B1.20.1-1983, Comply with stands AS/NZS 2053. 8, hexagonal pressure nut, sealing ring and ferrule. Connector body - Galvanized die casting，zinc plated steel& malleable iron， nickel plated brass, stainless steel. Hexagon pressure nut - Galvanized die casting zinc plated steel& malleable iron，nickel plated brass, stainless steel. Ferrule - Galvanized steel or stainless Steel. According to customer's samples and specifications, we can manufacture special fittings for suit any type of flexible conduit applications.